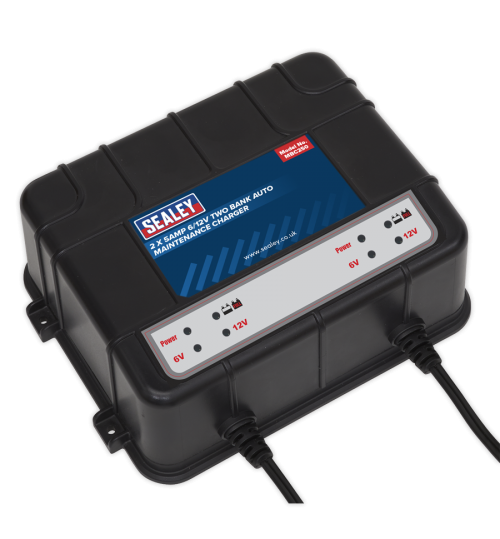 Compact 6/12V dual bank battery charger perfect for automotive, motorcycle and marine workshops. Suitable for charging a variety of batteries, charger reacts continuously to battery condition and delivers whatever charge rate is required. Two bank charger outputting 2 x 5A depending on the condition and charge of each battery. Constantly regulated voltage patterns allow the battery to be recharged fully and safely without fear of overcharging. Compatible with all AGM, Gel and VRLA flooded batteries commonly found in everything from automotive and farm equipment to motorcycles, ATV’s, golf buggies and personal watercraft.